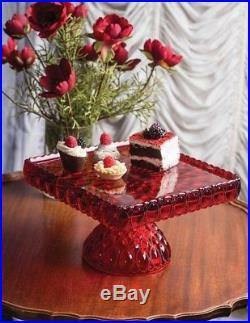 Victorian Trading Co Elizabeth Mosser Pedestal Cake Plate Ruby Red. From the Victorian Trading Co Elizabeth Mosser Pedestal Cake Plate. Present petit fours and confections with a Scottish flavour. Stacked or arranged side-by-side, the prickly purple bloom of Scotland is pressed into ruby glass by time-honoured Mosser Glass. Was founded in 1987 by Melissa Rolston. With modest origins as a home-based business designing nostalgic greeting cards and birth announcements, the company has since grown into a destination for unique antique replicas. We are comprised of artisans and romantic spirits dedicated to a beautiful aesthetic. All items listed for sale are brand new in their original packaging (unless noted otherwise). Powered by SixBit's eCommerce Solution. 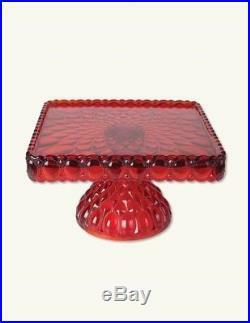 The item "Victorian Trading Co Elizabeth Mosser Pedestal Cake Plate Ruby Red" is in sale since Tuesday, September 11, 2018. This item is in the category "Home & Garden\Kitchen, Dining & Bar\Glassware". The seller is "victoriantrading" and is located in Lenexa, Kansas. This item can be shipped to United States, Canada, United Kingdom, Denmark, Romania, Slovakia, Bulgaria, Czech republic, Finland, Hungary, Latvia, Lithuania, Malta, Estonia, Australia, Greece, Portugal, Cyprus, Slovenia, Japan, China, Sweden, South Korea, Indonesia, Taiwan, South africa, Belgium, France, Hong Kong, Ireland, Netherlands, Poland, Spain, Italy, Germany, Austria, Israel, Mexico, New Zealand, Philippines, Singapore, Switzerland, Norway, Saudi arabia, Ukraine, United arab emirates, Qatar, Kuwait, Bahrain, Croatia, Brazil, Chile, Colombia, Costa rica, Dominican republic, Panama, Trinidad and tobago, Guatemala, El salvador, Honduras, Jamaica, Antigua and barbuda, Aruba, Belize, Dominica, Grenada, Saint kitts and nevis, Saint lucia, Montserrat, Turks and caicos islands, Barbados, Bangladesh, Bermuda, Brunei darussalam, Bolivia, Ecuador, Egypt, French guiana, Guernsey, Gibraltar, Guadeloupe, Iceland, Jersey, Jordan, Cambodia, Cayman islands, Liechtenstein, Sri lanka, Luxembourg, Monaco, Macao, Martinique, Maldives, Nicaragua, Oman, Peru, Pakistan, Paraguay, Reunion.